Derry City captain, Ryan McBride returns from suspension for the visit of Galway United. 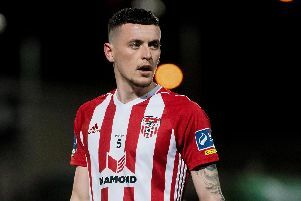 GALWAY United are reported to be travelling to the Brandywell with NINE first team players ruled out, but Peter Hutton refused to take any notice given his own injury problems. The Brandywell boss, still hurting following his last home defeat against Bohemians, has discussed the dangers of tonight’s game with his squad as he’s anxious to make a sustained climb up the Premier Division table, starting with a victory tonight. With the second series of fixtures kicking-off this evening, Derry’s first series total of 13 points from a possible 33 making very poor reading. “Our total has fallen well short of what I had expected, but there were quite a few games in which we played well enough yet failed to getthe result we deserved,” said Hutton. “So we’ve got to push on and while we will have key players missing for the Galway match, I will reiterate what I said last week insisting that it’s down to the players brought in to prove themselves,” he added. Hutton admitted that the Faithful were getting restless, but he was confident that his side would improve and a victory over Galway would, obviously, get the second series of games off to a decent start. With Derry having now played all the teams in the top flight, Hutton felt the second series of games would be more beneficial. “I think the opposition will now be more familiar to the players this time around. They will know who they are up against in terms of personnel so, hopefully, we will give better performances and record more favourable results. “We’ve already discussed the Galway game this week and the importance of remaining fully focused.